Former Rangers striker Kenny Miller insists he has not opened talks with Ibrox manager Ally McCoist on signing for the club for the third time. The 34-year-old struck an agreement on Sunday with Major League Soccer outfit Vancouver Whitecaps to terminate his two-year contract two months early. One newspaper immediately claimed a contract had been agreed with Rangers, who won the Scottish League One title. But Miller told the official Whitecaps website: "It's not been discussed yet." The former Bursaspor, Celtic, Derby County, Hibernian and Wolves striker, who has 69 Scotland caps, joined Whitecaps after leaving Cardiff City in June 2012 and scored 13 goals in 45 appearances. Rangers are preparing for next season's Championship campaign under a financial cloud following a financial review by chief executive Graham Wallace, who has promised budget cuts. 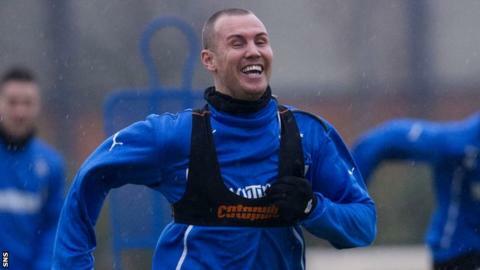 McCoist, though, has not hidden his desire to re-sign Miller, who has trained at Murray Park on several occasions during breaks from Canada. However, asked if England could be his eventual destination, Miller said: "I would probably doubt whether the chance to go back to the Premiership would come up again. "But I wouldn't rule out anything else, whether that is abroad, back home or England. "I'm open to listening to anyone who is interested, but you can't pick and choose your destination. "There is nothing in place as of yet. What this does is give me six or seven weeks to first have a holiday and then sit down with my agent. "He can then earn his money and find me a new club for 1 July. I wouldn't rule anything out." Miller retired from international duty after scoring for Scotland in their 3-2 friendly defeat by England at Wembley in August but is not ready to call time on his club career. "If you speak to any ex-player, they tell you to play as long as you can because it's the one thing you miss," he explained. "So, realistically, I can see myself playing for another three years. Obviously, I'm getting older, but I feel as fit as I've ever done."